AND I don’t mean the Russians or their busted thermometer. I mean the temperature manipulators at NASA GISS, NOAA, BoM et al., and the sycophant mainstream, climate-obsessed media who spruik their “Super-Hot Arctic”, “Hottest Year Evah” pseudoscientific propaganda PR BS. Claims that everywhere apart from the Eastern USA was warmer than ‘normal’ this winter turn out to be wide of the mark, in parts of Siberia at least. The thermometer in a remote Siberian village known as the coldest inhabited place on earth has broken as temperatures plunged to near-record depths, reports the Daily Telegraph. 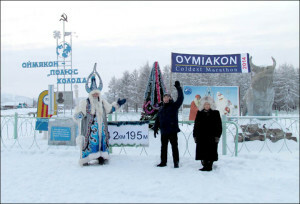 The public device, which was installed in Oymyakon as a tourist attraction, recorded -62C, before malfunctioning this week. Meanwhile the Siberian Times reports that some locals had readings as low as -67C – in touching distance of the record -67.7C, which was logged in the village in February 1933. The real ‘deniers’ if you like. Worse still, these guys, Connolley, Schmidtt and Mann are history ‘re-writers’. There truly are no boundaries when formulating the climate scam. Beginning in 2003, software engineer William Connolley quietly removed the highly inconvenient references to the global cooling scare of the 1970s from Wikipedia, the world’s most influential and accessed informational source. It had to be done. Too many skeptics were (correctly) pointing out that the scientific “consensus” during the 1960s and 1970s was that the Earth had been cooling for decades, and that nascent theorizing regarding the potential for a CO2-induced global warming were still questionable and uncertain.